Some anglers may make it look easy, but the fishing at Churn Pool is best described as quite challenging. 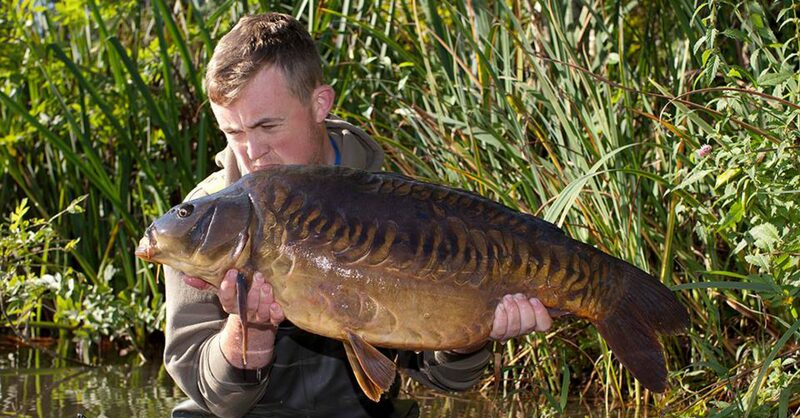 Churn Pool gives anglers an opportunity to catch some fantastic carp, with some of the fish over 30 years old. There is a good head of fish, with very high proportion of 20lb+ fish, numerous 30lb+ , there have been 3 different fish over 40lb, the lake record is currently 42lb. At times the fishing can be tricky, but the rewards are there for those who are prepared to work for their fish. Several groups have had over 30 fish in a weekend and double figure numbers of captures is a common occurrence. As is often the case with small waters, the fishing can be moody, often responding fast to changing weather and atmospheric conditions. Anglers who adopt a stealthy approach tend to do well, although every method can have its day. The fish can be caught all over the lake, everywhere from the deep margins to open water. In the height of summer, there is some weed present, but not enough to cause any problems. Most of the bottom is fairly firm, with lots of gravel present. There are a lot of zebra mussels, mostly under any submerged branches and steep bar sides. The carp seem to love them, but they are very sharp and can cause cut offs if not careful. 15lb+ line is recommended for its abrasion resistant properties. Crayfish are present in the lake and can be active at certain times of the year. We have these professionally removed to keep their presence to a minimum. Although not always a problem, it is recommend to fish accordingly and be proactive with your approach if they are active. We would be happy to help if you have not encountered them before. My honest advice has always been to recommend what you are confident in and what has worked for you before. Unfortunately I have seen a fair few baits that aren’t that great, many an angler chopping and changing baits due not having confidence in what they are using and struggling to put fish on the bank as a consequence. If you want to get your hands on a great bait with a seriously impressive track record and maximise your chances of catching, , check out the Baitworks products on their website and Facebook page. Since its inception, the Baitworks products have caught Churn Pool carp over and over again, they see a great deal of it and recognise it as a year round food source. On the Baitworks website – www.baitworks.co.uk – there are many great instructional videos on how to gain the most from the products, many of them filmed at and featuring captures from Churn Pool. If I had to recommend one bait to bring, for year round consistency, it would be the Atlantic Heat. Couple a few KG of this with some Hard Hook baits and a tub or two of Pop Ups, you have everything you need to take the worry out of the bait side of your visit. We now stock a large range of Baitworks products here at the fishery. You can also pre-order by giving us a call if you would like a specific package of bait here waiting for your arrival. If you prefer, you can buy the Baitworks products online before you arrive, or you can visit the factory, situated less than 10 minutes away, while you are here with us. Particles also work very well, especially in the summer months. Maize and tigers especially stand out as being effective. Before your visit it can be worth doing some research into what has worked here in the past. Some videos filmed here at Churn Pool that are well worth watching!